Maestro Monkey, the first of our gender-neutral characters and Conductor of the T.R.A.I.N.™, hails from Chicago, one of the major railroad hubs in the U.S., as well as a golfing hotbed. Maestro also uses artistic, musical and directing skills by moonlighting as the Conductor of a symphony orchestra. 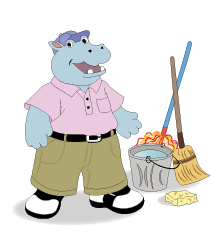 Maestro is imaginative, likes to tease by moving ears and playfully showing teeth and gums. 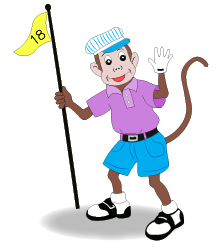 Nimble, clever and quick, Maestro Monkey likes to sway rhythmically with the music, a trait transferred to the golf swing. Lately Maestro’s become mindful of nutrition. In addition to eating a dozen bananas a day, Maestro stops the train at the Choo Chew station so the passengers can get some well-balanced nourishment. 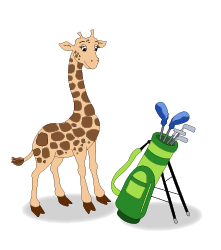 Genial Giraffe, also known as GiGi or GG, comes to The Little Golf T.R.A.I.N.™ from the rainforests of Brazil, full of hope for the future of our children. GG doesn’t show a lot of emotion and is not openly outgoing, preferring to quietly stay in the background and learn by observing the others. Some call Genial Giraffe poker faced, and GG is known to play an astute game of cards. GG has graceful movements, from walking elegantly to swinging a golf club with rhythm and synchronization. Using self smarts, GG is constantly developing new ways of doing things. Eager Elephant (or E Squared) has a long history of teaching young children. Eager’s secret, which is replicated in successful pre-schools around the world, is to teach through play. Eager’s training at the University of Calcutta in India drove home that this is, in fact, how young children learn. EE is always responsible and always polite. 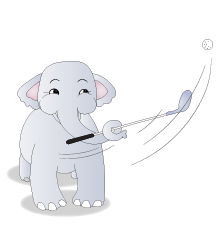 Eager Elephant can be analytical in breaking things down into parts, but the name comes from an eagerness to learn new things, practice hard and help others. Like the time Eager developed a new pitch shot technique, slinging the ball with its trunk high over a bunker, landing it softly on the green. 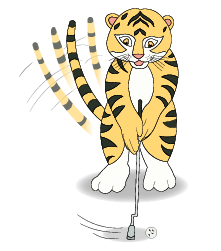 Tempo Tiger grew up in the forested mountains of China and came to Little Golf T.R.A.I.N.™ by way of Julliard. That’s where Tempo honed its upbeat skills, hence the name. It’s also where Tempo learned to swing its tail like a metronome, which was transferred into an excellent putting touch. Tempo can be emotional and hot-headed, but always sees reason eventually. Tempo Tiger learned that lesson the hard way once when hitting a shot over the green, the ball striking a tree and ricocheting into a water hazard. Tempo was soooo upset, but on the next hole calmed down by breathing deeply and purring from tee to green, and then sinking a long, breaking putt.